Although I live in the burbs, amongst old horse farms actually, I’m definitely a city guy. I love the conveniences that only a city can afford and I even love exploring foreign cities when I travel. Paradoxically though, I’ve always also enjoyed the natural wonders that only an escape through nature can provide, but when it means actually living that lifestyle, well, I’m out of my comfort zone. All of these thoughts and more floated through my navigationally challenged head as I drove along the Cowboy Trail, destined to spend a couple of days learning how to be an urban cowboy in Alberta Canada. Lest there be any confusion, the Cowboy Trail is an actual trail. Otherwise known as Alberta Highway 22, this peaceful road passes through countless ranches and farms as it gently follows the eastern slopes of the Canadian Rockies. I love mountains and having them as a constant companion only heightened my excitement for the next two days. Working with Travel Alberta my mission was simple. Spend two days on a working ranch and see how I fared as an Albertan Cowboy. To some the concept may sound strange, but the cowboy tradition in Alberta is just as rich and has just as much history behind it as its American counterparts. There was a time when borders were fluid, when the ebb and flow of the land was all that mattered. Montana or Alberta, it didn’t matter so yes, the Canadian cowboy tradition is a lot like what we find in the US, down to the chaps and hats. 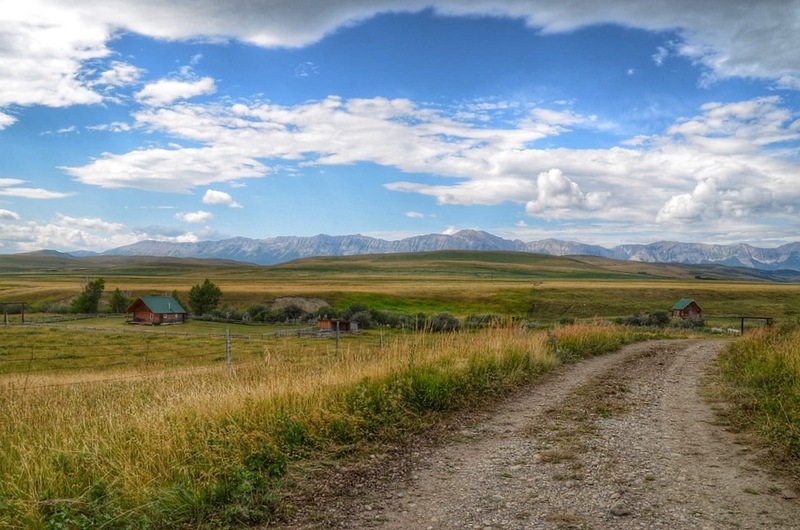 Sierra West Ranch is located about 11 miles north of the village of Lundbreck on the Cowboy Trail, smack dab in the foothills region of Southwestern Alberta. You have to pay attention as you drive along or you’ll miss it, the name of the ranch written above the wooden gate. Randy & Ginny Donahue have called the beautiful area next to the mighty mountains home all their lives and Randy has been ranching at Sierra West for more than 30 years. An experienced horseman who has done it all from rodeos and competitions to being one of the top experts in the province on livestock and ranching issues, it wasn’t until he retired from the oilfields that the ranch saw its latest iteration. Sure, Randy and Ginny have plenty of livestock and horses and operate a real, functioning ranch in every sense of the word. But about a decade ago they decided to invite others into their lives, so that everyone can live out their own version of the Cowboy Dream. They built a series of beautiful cabins ranging from luxurious retreats to authentic replicas of 19th century frontier homes (with running water though). The effect is a new family that has been welcomed into their lives – people, like me, seeking a little bit of serenity and to see if we have what it takes to be a real cowboy. Morning comes early and evening stays late during a typical summer in Alberta – the incredible number of daylight hours makes up for a sometimes gloomy winter. For ranchers that’s good news, as it means an early start and for me a quick entree into learning all about horses. I’ve ridden horses before, but only twice and in a line format so that each horse follows the one in front of it. For the tourist it seems little more than an amusement park ride since no real horse handling knowledge is required. Turns out that’s not what riding a horse should really be like. Meeting my steed for the day (Keystone) then brushing and grooming him, it was a slow and easy start into my day as a cowboy. We took the horses a few miles away to where one of Randy and Ginny’s herds of cattle like to roam and quickly set out to work. I was nervous. Terrified actually. I think horses are great, but riding them is an entirely different matter. They’re real, live animals with thoughts and emotions all of their own and all I could think about was how badly I might screw up the entire experience. I had Randy and Ginny there with me though, so I really shouldn’t have worried at all. Within a few minutes and after some simple instructions, Keystone and I were trotting around, still uncertain of each other but an amicable truce had been established. I quickly forgot about my concerns though, the scenery now consumed all of my thoughts. It was stunning, even that is too weak a term to describe the majestic mountains in the distance and the ranchlands that ambled up to them. Randy retrieved his herd of longhorns, and we herded them around to a better spot in the fields. Keeping my distance from the cows, yet staying close enough to herd them in the right direction, I quickly fell into a graceful rhythm, letting the horse do what he does best. It was a short but sweet introduction to basic horsemanship, and while I may have felt like it I’m sure I wasn’t the worst they’d ever seen. Every day during the summer months they welcome all walks of life onto their ranch, everyone seeking something different. Some come to just disconnect for a few days while many others have experience with horses and join in on cattle drives; overnight affairs that is on the bucket list for many horse lovers. Their commonality though is that almost all come from cities, urban centers where the last thing on their minds is horse care or the gorgeous sunset. I was there for much the same reason, to find a part of myself that had been lost; to find some beautiful solace not only by pushing my comfort zone but by being in one of the most beautiful natural retreats the world has to offer. The ranch was full the night I was there and Ginny and her staff made a delicious meal, inspired by the ranch of course. Beautiful beef, potatoes, corn and all the fixings – it was as wholesome and wonderful as the rest of the Sierra West experience. Wholesome, that’s a good word to use. Living on the ranch, even just for a couple of days, is a return to a time of innocence. There is no cable TV, no phones, just the foothills, the stars and your thoughts. There’s a lot to be said for that. A cowboy poet and songwriter joined us after the massive meal, regaling us around the campfire with decades old songs and poems of dubious repute. Looking up, the stars extended in every direction and I thought at the time that life could not have been more perfect. A day of physical exertion followed by great food and companionship. Sure, I learned some tips about how to handle horses, I threw (successfully) a lasso and discovered more about the long history of Alberta’s cowboy history. But more importantly, I learned a lot about myself. I learned that I can be thrust into wildly alien environments and not only survive but thrive. I think that feeling of accomplishment, that beautiful warmth of a job well done, that’s what brings people back to Sierra West year after year.